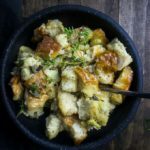 Simple, basic homemade Thanksgiving herb stuffing. Place 2 tbsp. of the butter in a skillet over medium heat. Add the onions and celery and cook until soft, about 3-5 minutes. Add the fresh herbs, salt and pepper. Remove from heat and set aside. Place the toasted bread cubes in a large bowl. Add the onion mixture and toss gently to combine. In a separate small bowl, beat the egg and combine with 1 cup of the chicken stock. Pour the egg mixture over the bread cubes and mix to distribute. Place the stuffing in a baking sheet. Melt the remaining butter and drizzle over the top. Cover the dish with a lid or foil and bake at 375 for 30 minutes. Remove lid and bake an additional 10-15 minutes, or until top is golden brown. For better results, use toasted bread cubes, not stale bread cubes. Stale bread cubes soak up the liquid faster and can result in mushy stuffing. Use the full amount of butter in the recipe, even if it seems like a lot. The butter is what keeps the stuffing moist and gives it that slightly crispy, buttery texture/flavor. If your stuffing is dry after you add the broth and onion mixture, add more broth until the desired consistency is reached. Be careful not to add too much or your stuffing will be soggy. To make your stuffing ahead of time, follow all the above instructions up to the point where you pour the butter over the top before baking. Cover and store in the fridge overnight. When you are ready to bake it, pour the melted butter over the top and follow the baking instructions. To freeze your stuffing, Follow all the above instructions up to the point where you pour the broth butter over the top before baking. Wrap in freezer safe wrap or prepare in a freezer safe container - can be frozen for up to 3 months. Drizzle with the broth and melted butter, and cook according to the recipe instructions when ready to use, adding an additional 10-15 minutes. You can also freeze cooked stuffing. Place it in a freezer safe container or bag and freeze for up to 3 months. To reheat, place in a 350 degree oven for 15 minutes, or until heated through. Add additional broth if necessary if stuffing is dried out. How to reheat stuffing: Let the stuffing come to room temperature. Bake in a 375 degree oven for 30-40 minutes, until warmed through. If stuffing is too dry, add liquid, just a little at a time. Note, if stuffing is brought to room temperature properly, you shouldn’t need to add additional liquid.